Before we get stuck in – Congratulations; you got the job! But wait – have you actually managed a team before? If your skills in the managing department are lacking, you might feel intimidated and apprehensive starting a new managerial role renowned for its heavy duties. It’s a question of knowing how to behave, what you need to know to fulfil your duties and most of all – know how to keep your job, all whilst demonstrating your capabilities as a manager and a leader. 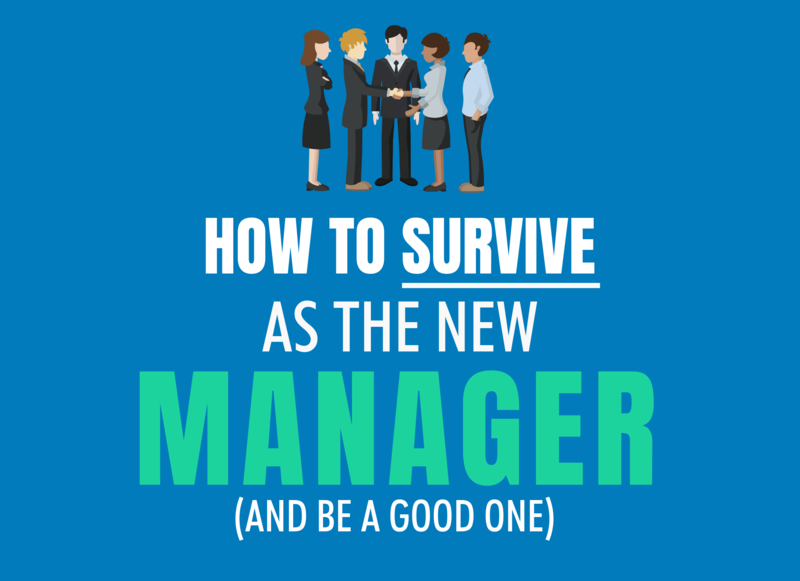 With our highly comprehensive guide and fruitful infographic, we'll show you the definitions, mistakes and steps involved in becoming the best manager you can be - no matter how new of a manager you are! Vlatka Hlupic, Professor of Business and Management at Westminster University states that managers “don’t get adequate management training in softer skills”, but are rather promoted for their technical ability required for the job. Without the right management, leadership and people skills, this can ascertain significant hindrance on the team and prevent a manager from fulfilling all of their required duties. With this in mind it's important to talk about Leadership – a common word used in the workforce is known to have a substantial difference between ‘management’ (which would be a whole other topic in itself). For the purpose of this guide, we want to show you that leadership skills make you a better manager in the long run. Some of the many duties you’ll perform as a manager will be looking after budgets, planning, controlling operations - but most importantly, you’ll be leading a team. The meaning behind leadership becomes lost when you’re simply taught how to delegate tasks to your employees. You simply become the person who calls the shots and this isn’t always a good persona to be viewed as. As a new manager, you need to think about how you're going to build a rapport, trust and motivation within your team. Management can be seen as the mechanical, task-based aspect of your role, but actually being responsible for your team and its collective success. This is where becoming a leader can really come into play here as it gives your fellow employees faith in your abilities to lead the team to commercial as well as team success. Employees gravitate towards managers that have the ability to lead, inspire and possess a likable personality. They take a great interest in the success of their fellow employees by helping them achieve their goals (and not necessarily for the company’s sake either). A leader will have a vision of where they themselves and the team need to stand. They want a collective team involved in outlining this vision and its successes, as well as draw-backs. Leaders can be trusted and have a team that looks up to them and the examples they set. They push employees to challenge ideas, be thoughtful in their own processes and do their best. They will always keep the team informed of exactly what’s happening in both the present and the future, as well as informing them of how any changes will affect the team. One of the main things to identify and challenge as a leader is to ask the questions ‘what’ and ‘why’. By questioning and challenging authority (professionally) in order to modify or even reverse an action that could be detrimental is a vital skill to have. With this being said, in order to carry out these duties as a leader you must have a good sense of judgement, especially if you stand up to senior management. Should there be a rough patch within the business – a leader must be able to ask “what can we learn in order to move forward?” and make an action plan to lead a team out of dismay. Managers are essential in keeping an eye on all workflow and ensuring the work standard being executed is up to scratch. This is why their ability to ask the questions ‘how’ and ‘when’ is essential to ensure deadlines are met and the quality of work being produced is of a satisfactory standard. The status quo of an organisation is generally upheld by a manager and they do not tend to challenge this. The strategic assets of a manager allow them to break down a vision into actionable steps in order to develop a team roadmap. Managers need the ability to direct and delegate tasks to a team as well as provide resources for their colleagues to do their tasks effectively. Establishing work rules, best practice and procedural standards comes with a manager’s authority and for the best interest of their team. Managers are regarded for their ability to cater to the needs of the people and are equally as responsible for listening to them, as well as involving them in decision making and accommodating reasonable requests. The majority of new managers lack the essential training required for the job. They also misconstrue the values and awareness needed to communicate with employees from the initial stages of obtaining a managerial position – which highly affects lasting impressions and future prospects. “Leaders” who dominate fellow employees, people, decisions and processes are simply leading by fear and a lack of company vision. This can also come under the form of micromanagement, causing your team to lose motivation and creativity to do their own job well. Don’t make the mistake of talking about yourself constantly, especially in a self-promoting demeanor as this will come across arrogantly and boastful. This can give the impression that you lack the ability to recognise the importance and achievements of others – leaving only a grandiose of your own importance. Sometimes it’s not the inability to listen to your team members, but to actually hear and respond appropriately to what they are trying to communicate. This inspires a lack of respect towards your employees, which comes back around two-fold. Active listening is a critical management skill – it provides recognition and allows you to demonstrate constructive feedback. Not listening can cause employees who have previously voiced their opinions to you will seldom do so in the future, causing lack of communication and conflicts – which unfortunately, as the manager, can reflect badly on you. This goes hand-in-hand with listening. Without listening skills your feedback can be misconstrued as non-actionable. In addition to this – not giving any feedback at all is one of the worst behaviors you could exhibit as a new manager. Feedback shouldn’t just be left to a bi-yearly review. If you have immediate positive (or constructive) feedback then this can highly benefit your employee’s skill progression. Criticizing as opposed to providing actionable feedback is a key killer here. By talking purely about what’s not working without leading in with the positives first can be a real mood killer, especially when reviews and feedback can often be anxiety-inducing for your employees. The best kind of communication you can give must come across transparent. Whilst some information should be held (for example, data protection or an unconfirmed project) – you should be sharing what you know with your employees constantly. By failing to make standards or giving people unrealistic and unclear expectations is a recipe for failure. Be transparent with your expectations without destroying an employee’s empowerment or engagement. You should also be asking for feedback when communicating a task or ideas on a project so that employees feel a sense of value and engagement. Should any ideas not be implemented – explain your reasoning and empower the ‘suggestees’ to keep up their proactive attitude in future projects. A self-referential manager can come across as alienation. Talking purely about how you would do things does not inspire confidence or give an employee any leverage to improve in the future. If you are challenged with the feedback you’ve provided, it can be easy to act up and defend what you’re saying. By providing evidence in a concise and actionable way can allow people to feel at ease and trust your opinions - Backing this up with offering your support will further reinforce your feedback. Employees must feel like they receive equal treatment – that doesn’t mean be 100% upbeat around every person you come across, but the mutual respect between every interaction can make all the difference in feeling valued. Inequality can also be demonstrated in making decisions and then asking people for their input. It is one of the most common mistakes you can make. It communicates that their feedback never mattered in the decision-making process. Creating hierarchical permission steps, obstacles and roadblocks can hinder employees from coming to you directly with an issue or suggestions for improvement. By enabling employees to make their own decisions about their work strongly advocates employee empowerment – resulting in higher retention and progression from your employees. Whilst some issues should lie in the hands of your HR department – any burning issues that people approach you with must be responded to with respect, and an open door. If an employee requires additional help or training on a task but you’re stretched thin, communicate that you’d be more than happy to show them the ropes and schedule a date and time to go through anything they need. If you have resources of your own that could help them leading up to your scheduled meeting then this also shows your proactive nature, and may even answer their original questions. In terms of personal issues - you might not be able to relate to what’s being discussed – if you’re able to then by all means. But simply listening and offering your time to let out some issues can help an employee feel like they can approach you should any other future events arise. Forging a personal connection with your employees will enable you to understand them better as people, what inspires/motivates them, how they learn best and what their personal goals are. One of the biggest qualities you can possess as a leader is focusing on the bigger picture. It’s very easy to get caught up in the weeds and intricacies however this vital skill means you won’t stray from what’s really important in your business goals. Allow yourself time to think and prioritise tasks for yourself and your employees. If this means getting into work at the crack of dawn to make a to-do list then this will highly benefit the structure of your day-to-day. Bounce ideas back and forth with your colleagues to encourage collaboration and perspective. Through this exercise your employees will get a sense of ownership over the conclusions you draw up. WHAT DO SUCESSFUL MANAGEMENT AND LEADERSHIP SKILLS ENTAIL? Whether you’re just starting out as the new manager on the block or you’ve earned a promotion you were after for so long – your first days as a manager can be the most daunting experience until it becomes second nature. Those that are on the job for the first time have had little to no training whatsoever to prepare them for such a role of responsibility which is what makes it all that challenging. No matter how much experience you have in your chosen industry, you’ll only be able to fulfil your duties as a manager well if you observe the people and culture within your workplace. If you’ve been promoted from a previous role then you’re likely to know the culture well already – and your new position shouldn’t change your persona or ability to interact with colleagues in respectful manner. Be open to the hard fact that a promotion can cause tension amongst your existing colleagues. Use your existing relationships to your advantage by delegating tasks to staff you know demonstrate specific strengths – this encourages a sense of acknowledgement and reinforces trust. Keep your notepad handy and take down notes on all the direct and indirect individuals you’ll be working with, especially those you’ll be reporting to and interacting with the most. These multi-level relationships will demonstrate your openness to the organisation, and it’s these relationships that could contribute to crucial success later in your career. Take note on how these individuals interact with each other, what inspires praise and recognition amongst them. Some companies place great importance in bringing ideas to the table. If you’re not one of these individuals then you can be perceived as a ‘poor’ employee – Every organisation is different, but keep this in mind and observe how your colleagues discuss business in meetings. It’s natural to take the back seat for the first few days to learn every aspect of your role, but this isn’t an excuse to miss out on opportunities you’re qualified and knowledgeable to contribute to. If you see an opportunity with the scope of your expertise – step in and show your willingness to support your team. Many new managers (and existing ones) feel that they need to ‘micro-manage’ which is a whole topic in itself and highly supports extreme control over workflow. It’s been highly debated how micromanaging can cause negative effects amongst the workplace, but it’s also an easy habit to fall in to. Over 5000 leaders who took the “Are You Motivated By Power or Achievement?” - And based on the results, around a staggering result of 41% of leaders had a very strong desire for power. By briefing a team appropriately and being available for any concerns, you’ll be able to communicate your expectations for your projects. This diminishes ‘lack of communication’ and demonstrates your goals clearly. Explaining why an employee has been chosen for a specific role is great for boosting morale and trust. It is also vital to set aside time to review the work thoroughly in order to assess your teams’ efforts in achieving your business goals. 1. Pick the right person for each job – freeing you to do more things of higher value. The more of your essential tasks that you can teach and delegate to others, the greater the time you will have to do the things that only you can do. 2. Match the requirements of each task to each employee’s strengths and skill sets. 3. Delegate smaller (or tasks of lesser complexity) to newer staff in order to show them the ropes. 4. Make your delegated tasks clear and concise, and also be available for circumstances of complications or burning questions. 5. Invite employees input and participation, be open to suggestions and encourage employees to feel that they own their tasks. Your role as a manager is to set the mood and paint a picture of ending success, all whilst keeping your employees supported in the process. By communicating the ‘why’ in every delegation you offer is critical for employees to envision the bigger picture themselves. By failing to set context in your day-to-day delegation, you contribute to tension and unease within a team. “What’s in this job for me if I do it?” is a question employees ask themselves when completing a task – by communicating their capabilities, strengths and attributes towards a delegated task and its contributing success to the organisation inspires confidence and likeability. Repeat communicative actions across multiple touch-points ensures tasks and messages are processed by your employees effectively. When employees hear the same message repeated, they’re more likely to take notice, believe it, and most importantly, act on it. Like any job you take on – building a good relationship with your boss is imperative for your development and job satisfaction. The earlier you set a good impression the more likely you are to inspire trust and get key opportunities sent your way. Watch how they interact with other subordinates in the first few weeks on the job. By getting to know your team you’re able to learn to trust your employees and earn this trust back. By getting to know what is important to your team members’ shows that you believe they are a valuable asset within the team. Dismantling the ‘boss’ wall you break down the manager/employee standard to a more ‘co-working’ relationship which can put you and the other parties at ease. When leaders take a moment to invest in their team on a more personal level it shows that you care more about who they are as individuals – and not just what they do. Opportunities can arise with every encounter you have such as grabbing a cup of coffee to ease in to your new working space, develop new friendships and find out each other’s strengths. Like with any job you take on – building a good relationship with your boss is imperative for your development and job satisfaction. The earlier you set a good impression the more likely you are to inspire trust and get key opportunities sent your way. By letting your boss know how you intend to progress as a manager can work wonders in clarifying your progression within the company, and your overall development as a leader. If this is your first time in a managerial position then your boss will understand that many aspects of management can be quite daunting – but can aid you along the way whilst you hone in on your skills. Have targets set – such as hiring and keeping 3 new staff in the next quarter or running training workshops for your employees. Targets like these in addition to your company-based goals give you a clear progression route and more practice in running a team efficiently. Ultimately - sharing your goals with your boss gives them an idea of how you’d like to progress within the company and can work with you to develop a timeline of milestones to achieve over a set time period. Observing your superiors and mimicking leadership-style behaviour. From day one on the job you should be setting the tone of your leadership style from the outset. Exude confidence, self-assurance and respect with every person you encounter. Speaking how you want to be spoken to and actively listening will earn you the respect and trust you deserve. It’s a common misconception that money is the most important factor in job satisfaction. Unfortunately it’s not always possible to give your employees a raise every time they do well, however showing recognition towards your employees makes them feel motivated to work harder due to the appreciation that’s exhibited. Positive feedback lets your employees know they’re valued by the company and feel a sense of importance. It’s especially important when positive feedback is given after setting targets or areas of improvement to employees, as this gives them affirmation that they’re on the right track. Set new goals and challenges by asking your employees if they have any objectives or areas of improvement they’d like to work on. Show investment in your team’s progression by considering the company’s objectives and offer available resources that can improve your employee’s skills. Make these objectives challenging but measurable and achievable. Ensure you’re realistic and not working them to the bone. Encouraging a positive-feedback culture amongst one another is a great way for employees to recognise each other’s successes and foster a sense of community, in turn making the workplace feel empowered upon good feedback.